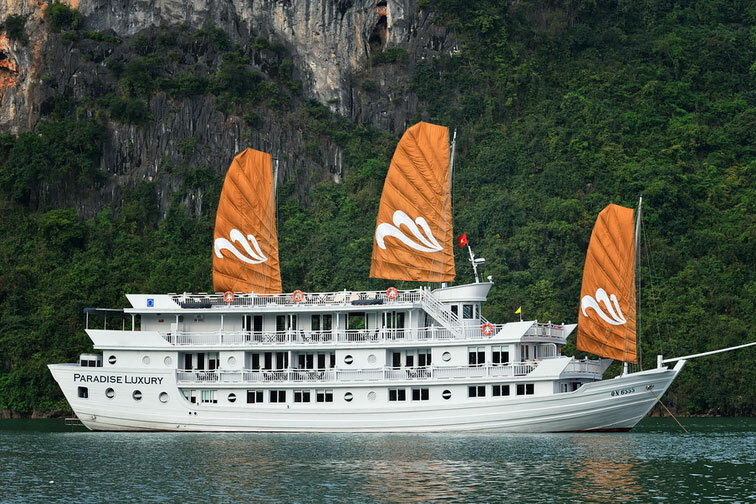 Paradise Luxury Cruise I, II, III & IV were built according to the traditional Vietnam cruise design and present a lavish outfit blending in subtle harmony with the natural environment of Halong Bay. 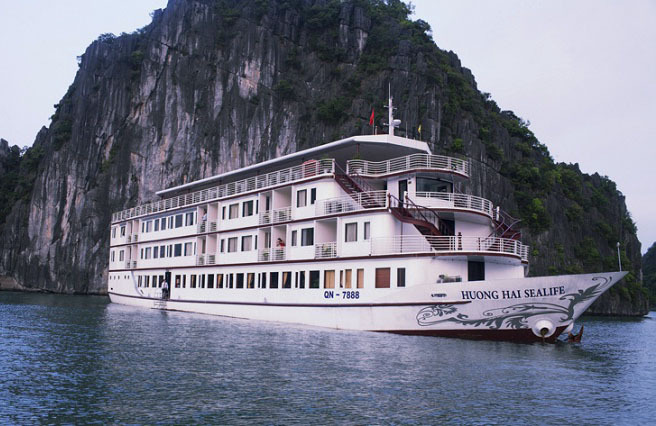 7.30 -8.00 pick you up at the appointment in Hanoi then transfer to Halong Bay, we arrive Tuan Chau port at 11.30 and check in the board at 12.15. 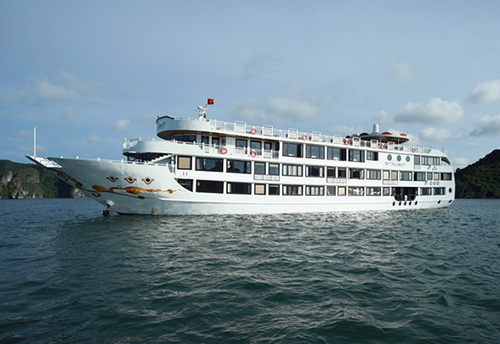 Welcome drink, briefing itinerary and cruise’s instruction. 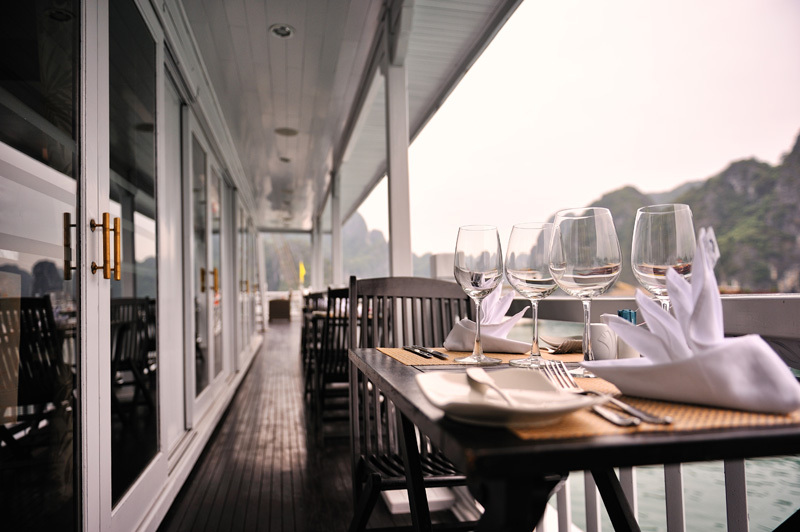 After that we enjoy set lunch at dining-room during our cruise passing though Ba Hang floating village and Halong view. Afternoon we doing the kayaking and paddle your way around while collecting trash from around the bay- you will be given all the equipment needed and staff will be ready and waiting onboard to receive what you’ve picked up and dispose of it properly after returning to shore. 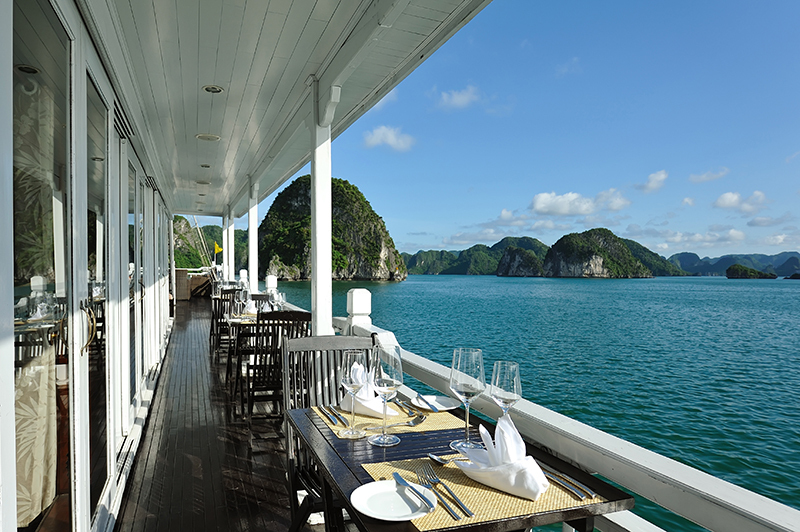 We keep going cruising and sightseeing in Halong Bay while the Afternoon Tea is served on the Sundeck. 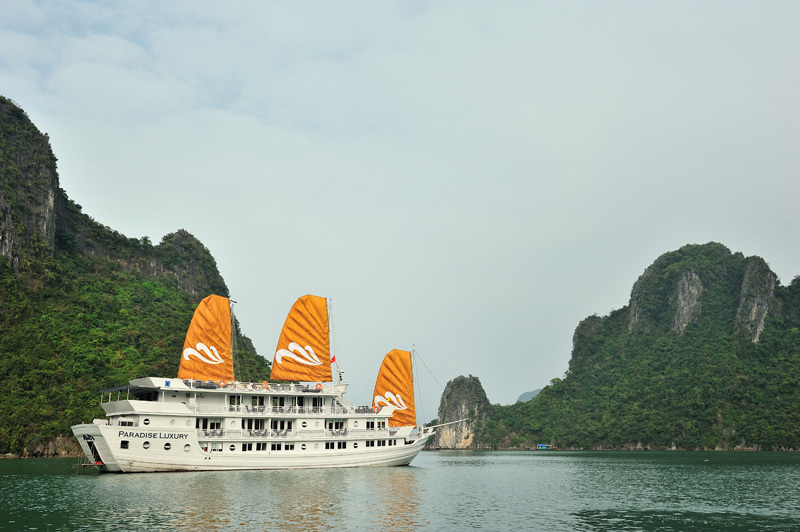 Paradise Cruise gives you the chance to see more undiscovered parts of the Bay- not only will you cruise through Halong Bay but you will also pass by many amazing areas. 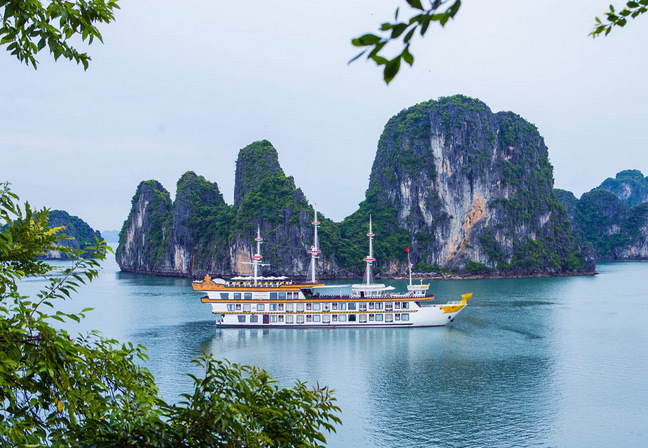 You will pass Luon Cave called the “Tunnel Cave” in English, due to its long 60 meters leading to a tranquil lake; Trong Cave, which enchanting interior is often used for gala-dinner and banquet and Ho Dong Tien cave whose mouth, you will see, is right at the sea level. Meanwhile, our Coffee and Tea brewing demonstration will introduce you to the traditional culture of tea and coffee in Vietnam. Nibbles include cakes and biscuits. 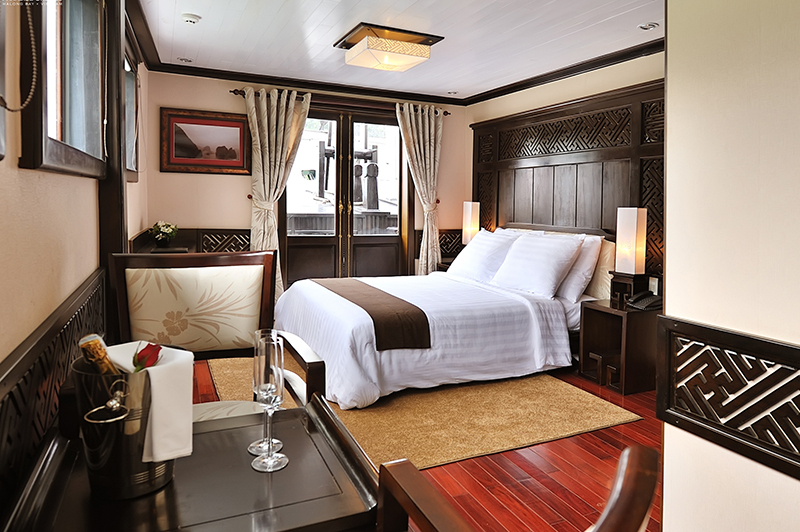 After lunch, shuttle bus pick up at Paradise Suites Hotel, back to Hanoi. 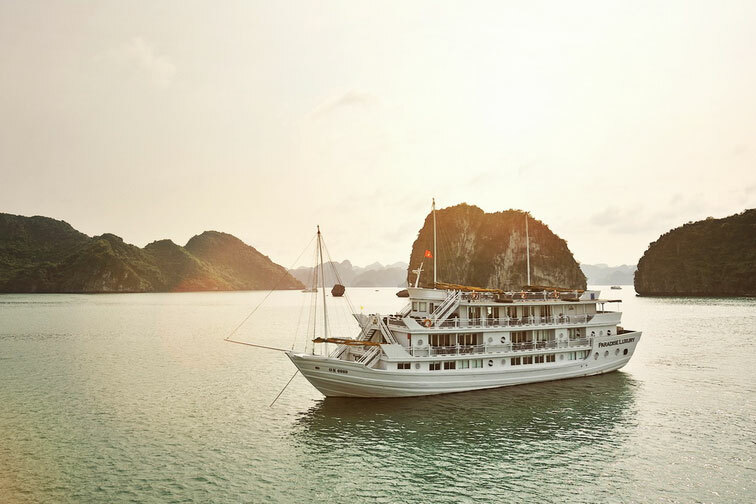 7.30 -8.00 pick you up at the appointment in Hanoi then transfer to Ha Long bay, we arrive Tuan Chau port at 11.30 and check in the board at 12.15. 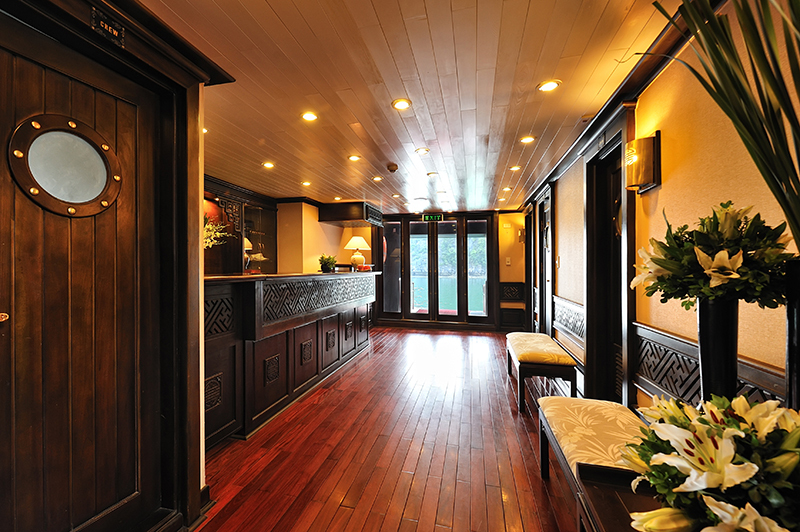 Welcome drink, briefing itinerary and cruise’s instruction. 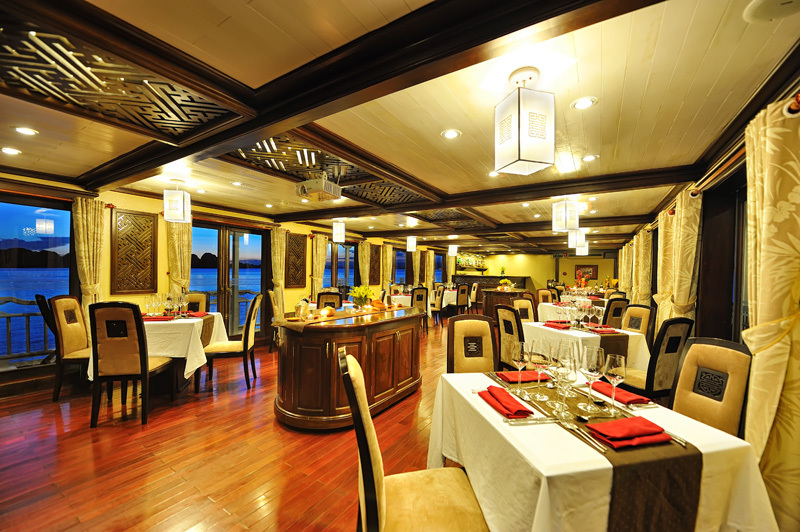 Evening enjoy a dinner with Vietnamese – Western menu after that you can joy in some activities such as: Movie Night, Squid Fishing or Beauty Spa services. 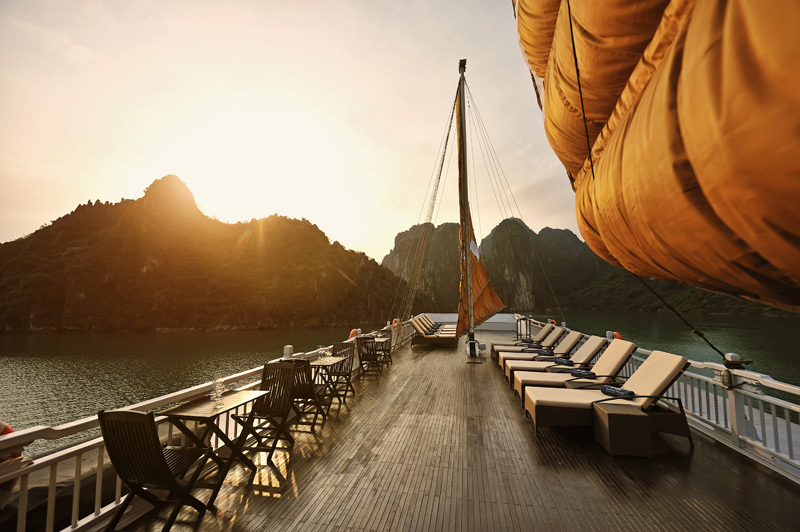 Get up in the early morning and take a part in Tai Chi session on the Sundeck, at the break of dawn. Then take a Coffee & tea with assorted homemade pastries at your disposition in the dining-room. 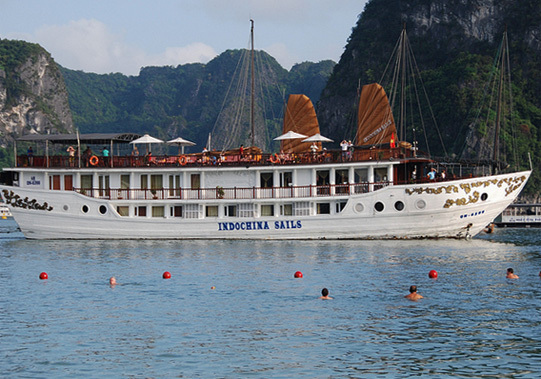 After breakfast, we will transfer to the Paradise Explorer, the day boat that will take you to places most junks cannot access. 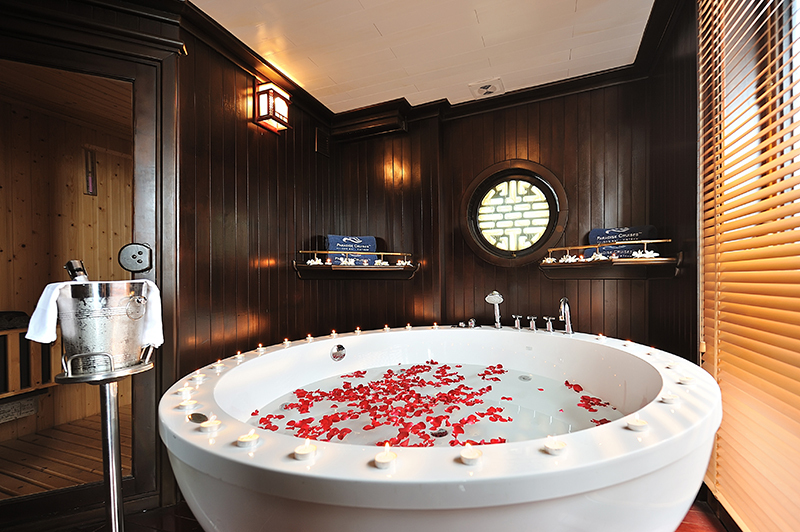 Note: Please leave your luggage in your cabin as you will return to Luxury afterwards. A bamboo rowing boat will take you to visit of the Vung Vieng Floating Village with its school, museum, tiny floating houses and the kind villagers. Back to the boat for lunch. 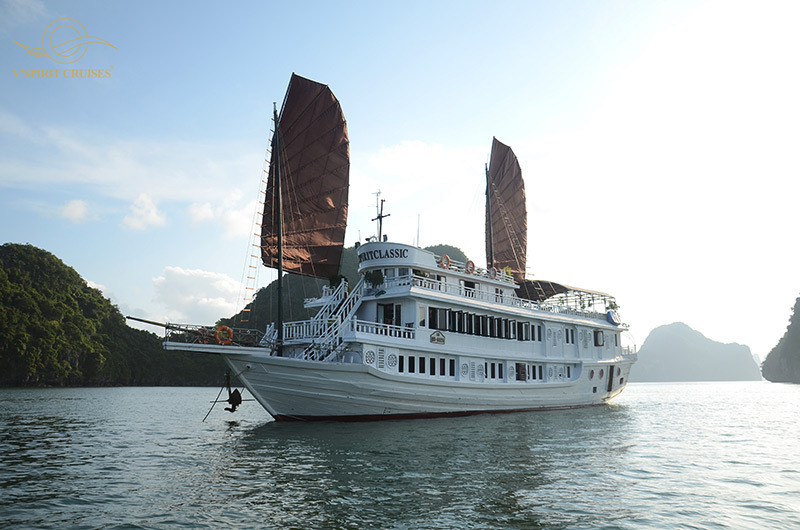 Afternoon, Explore Vung Ha Island and participate in trekking or kayaking activities. This beautiful and unspoiled island is a wild and less visited location in the Bay, which will amaze you with its charming serenity. After that we join in a cooking demonstration on the sundeck. Feel free to join again or for the first time if you did not on the first day. 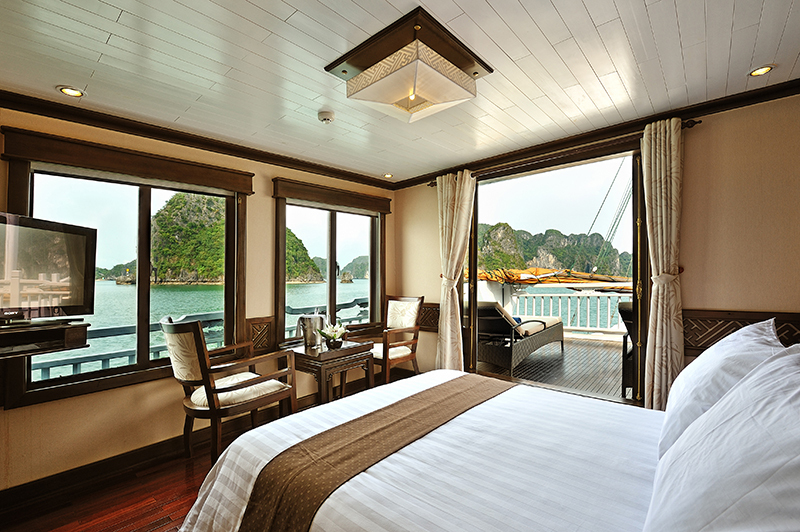 Paradise Luxury boats possess four types of rooms (total 17 cabins per boat) featuring stylish design and cosy amenities. 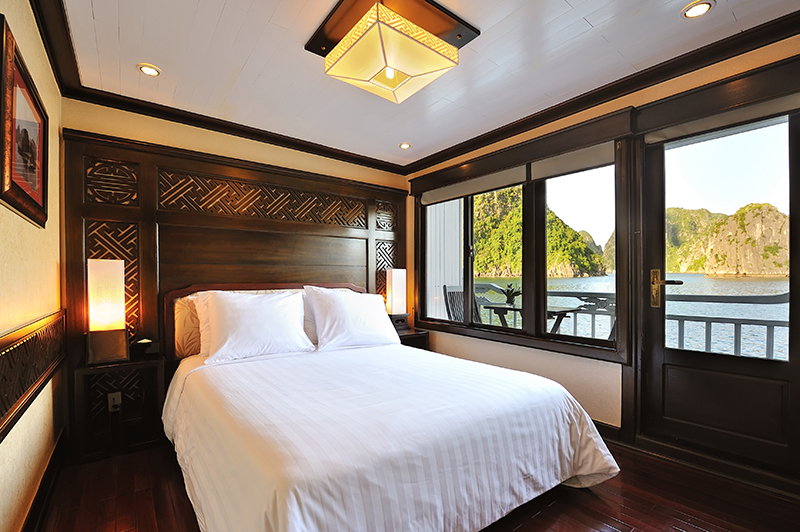 Built for you to enjoy the majestic viewings offered by the natural environment during the cruise, Paradise Luxury cabins are heavenly windows onto the beauties of Halong Bay. 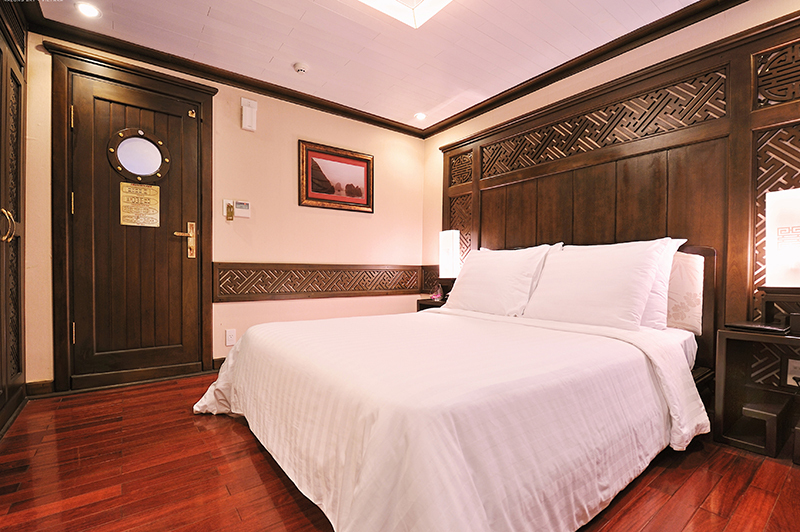 All the rooms onboard Paradise have been tastefully designed with shiny wooden floor and ornaments and furnished for the utmost comfort throughout the cruise.